Who Pays for Our Roads, Parking and Related Amenities? A common charge in the animated debates that often erupt when cycling features in the news is that cyclists should be registered and made to “pay their way”. At face value, this doesn’t seem like an unreasonable proposition – after all, users of motor vehicles all directly contribute to the National Land Transport Fund (NLTF) each time they top up their fuel tanks, register their vehicle or pay their road user charges if their vehicle has a diesel engine. By contrast, contributions from cyclists and pedestrians are somewhat obscured as they are not tied to a vehicle or its fuel, and instead come from contributions to local council rates and general taxation paid by those who drive and those who don’t alike. The New Zealand Transport Agency (NZTA) funds state highways and motorways mostly from the NLTF monies levied from motor traffic, although the Ministry of Transport also contributes out of the general taxation pool that all NZ taxpayers contribute to. 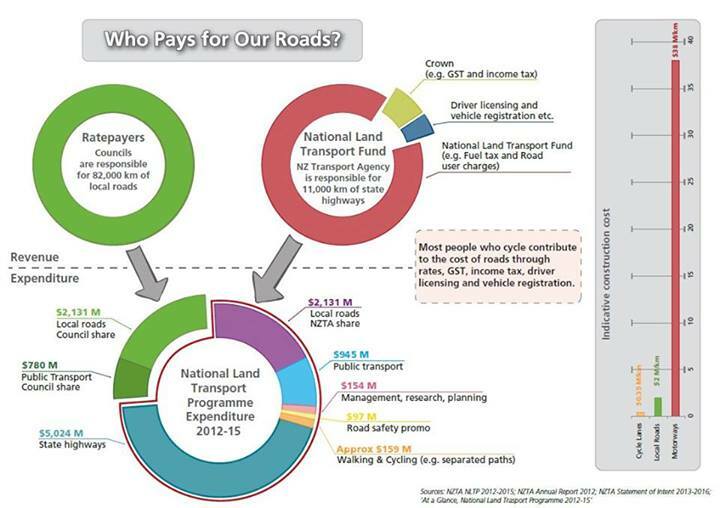 The proportion of non-NLTF contributions to total NZTA income is variable, but to give an idea of the taxpayer contribution, the NZTA/NLTF annual reports indicate it was around 10% for 2010*, 3.6% for 2011, 1.3% for 2012 and 3.5% for 2013. All public non-state highway roads and streets are considered local roads, and are funded about 50% by the NLTF with most of the remainder coming from local council rates, which all property owners and tenants pay (indirectly in the case of the latter, as a component of their rent). Private developers also make a small contribution. So, state highways and motorways mostly funded by motor vehicle users, but taxpayers also contribute. Local roads approximately 50% funded by motor vehicle users with the rest from ratepayers. Clearly the overly simplistic view of transport funding some people have is inadequate and leads to some popular misconceptions as to who is “paying their way”. What’s a Fair Contribution anyway? Several problems arise in trying to determine what a fair share of road funding contributions might look like for users of each mode of transport. Firstly, pedestrians and cyclists require only a very narrow corridor in which to travel, and don’t require on-street parking, which tends to consume a great deal of the public roading surface in urban environments. It could likewise be argued that complicated intersections and interchanges, traffic signals, flyovers, etc. are also quite redundant from the point of view of non-motorised transport users. Traffic congestion caused by cyclists and walkers is minimal. Other non-monetised externalities imposed by cyclists and walkers, such as noise, pollution and risk of injury or death to others, are also minimal compared to motorised transport modes. Arguably, by choosing not to make journeys by private motor vehicle, cyclists and walkers have a congestion reducing effect overall. Although NZ is one of the most car-dependent nations in the world, another complicating factor is that a good proportion of people use multiple transport modes on a fairly regular basis. For example, most adult pedestrians and cyclists also drive cars. Motor vehicle users’ fuel excise duty, road user charges and registration fees are hypothecated, meaning that they are ‘ring-fenced’ for transport funding purposes and can’t be used to fund e.g. schools or hospitals. In spite of this, additional taxpayer and ratepayer funding is always required to maintain and develop the public roading network. Clearly, motor vehicle users alone aren’t yet paying even the ‘balance sheet’ (or internalised) costs of operating the public roading network. Although motor vehicle users pay mandatory ACC contributions towards safety outcomes, other externalities imposed by motor vehicle users, such as congestion, pollution, noise and impact on the urban environment clearly are not compensated for. Car-oriented development tends to encourage urban sprawl, which means public transport users, pedestrians and cyclists tend to have to travel greater distances, thereby making these modes less appealing. A vital quality of urban environments is proximity; when people live and work in closer proximity economic output tends to be higher. Lower density development tends to work against this principle, and so when large swathes of the CBD area are given over to surface parking it equates with greater dispersal of economic activity. More central surface area given to car parking means less for commercial real estate – what effect is that likely to have on property prices and rentals? Of course, a more dispersed and less walkable CBD means people tend to drive from destination to destination, causing more congestion and greater demand for parking – a vicious cycle. These costs are all naturally rather difficult to quantify, and tend to be largely ignored, or addressed via social spending from other areas of local and central government spending. Indeed, it could be said that the transport mode we incentivise with public money necessitates further public money in the form of ‘band-aids’ for the resultant costs on others, only some of which are ultimately redressed. At the present time, Hamiltonians who are unwilling or unable to drive, whether due to simple reluctance, a medical condition or inability to afford the costs of operating a private motor vehicle, must contend with greatly reduced mobility vis a vis motor vehicle users. Many Hamilton bus services are infrequent or non-existent outside of business hours, and regular bus use – for all its inconveniences – is only marginally if at all more economical than owning a car. On this basis, I would argue that at the present time, car ownership must be considered as a de facto requirement for most productive citizens in Hamilton. Beyond roading and parking costs, this has implications for public health, liveability, and the local economy, with most of the revenue for fuel, parts and accessories for cars going overseas. If more people could safely and conveniently walk or cycle to most places they needed to get to, they’d have a substantial amount more money in their pockets. They’d probably be healthier too. Yes, nobody can deny that Hamiltonians, like most Kiwis, are heavy users of cars, but can we really say we’ve made a serious effort to promote alternatives and/or reduce the need for car journeys? Quite the contrary! We actively subsidise people to use private motor vehicles by contributing massive sums from rates and general taxation. Indeed, with roads never quite large enough for peak hour flows of mostly single-occupant vehicles, many large roading projects have been necessary. The Hamilton Ring Road is estimated to have a final cost of at least $84 million and is 55% funded by NZ Transport Agency, with the rest coming from Hamilton City Council. That leaves nearly $40 million that was not funded out of charges on road users, but was provided by Hamilton ratepayers, whether they drive cars or not. The upcoming Hamilton Southern Links project has an eye-watering projected cost of $450 million and will eventually see Hamilton grow out to meet Tamahere while accommodating a projected 20,000 people. It’s unclear what the funding split between NZTA and HCC will be at this point, but it’s certain that further car-dependent development like this and also other planned developments on Hamilton’s outskirts will only induce more car journeys and put further strain on Hamilton’s roading network. In the absence of such public largesse, congestion should be self-limiting to a great extent; faced with longer journey times, more people will look to live nearer where they work, shop and play, and/or will look to walking, cycling and public transport. Or we can just keep pouring public money that in competing economies would be funding schools, research grants, healthcare, etc into widening roads. Towards Hamilton as a Liveable City for Those Who Drive and Those Who Don’t! So, it can be seen that outlandish and unworkable ideas such as having cyclists, skateboarders, horse riders etc. obtain licences, have their ‘vehicles’ certified regularly and pay registration to use roads are simply not justified. Quite the opposite, in fact – clearly at some point we have to stop redistributing public money collected as rates and taxes in favour of those who use private motor vehicles, and instead use it to make alternative transport options more appealing. Until the scales are tipped more towards alternative transport modes, we’re going to be be stuck with a city where almost everyone drives everywhere because all alternatives are too inconvenient, giving a sprawling urban form that is difficult to serve with public transport, increasingly long commutes on congested roads and ongoing costly roading upgrade projects. Household budgets, and hence discretionary spending, will be at the mercies of the global oil markets. With only a degree of reallocation of funding and road space, we could see a city where a great deal of people went about their daily business without clogging up the roads. It’s happening everywhere else in the world, and it will happen here too, the only question is how much money we’ll commit to attempting to build our way out of traffic congestion before we accept the inevitable. Isn’t there a unused rail line from Hamilton City out to Tamaheri? Doesn’t this line go all the way out too Cambridge…if not short of Cambridge….If Hamilton wants to grow then grow with the rail links etc. I like that idea of unused rail lines. The Rail lines is still used Fonterra’s Hautapu dairy factory, and could easy be extended to Cambridge and used for commuters, similar to the Groningen to Veendam commuter rail service in the Netherlands. Another big cost of motor vehicles is the ongoing maintenance of roads – bikes and ped’ns cause negligible damage to roads. See http://cyclingchristchurch.co.nz/2013/02/18/mythbusting-cyclists-dont-pay/ for more info.